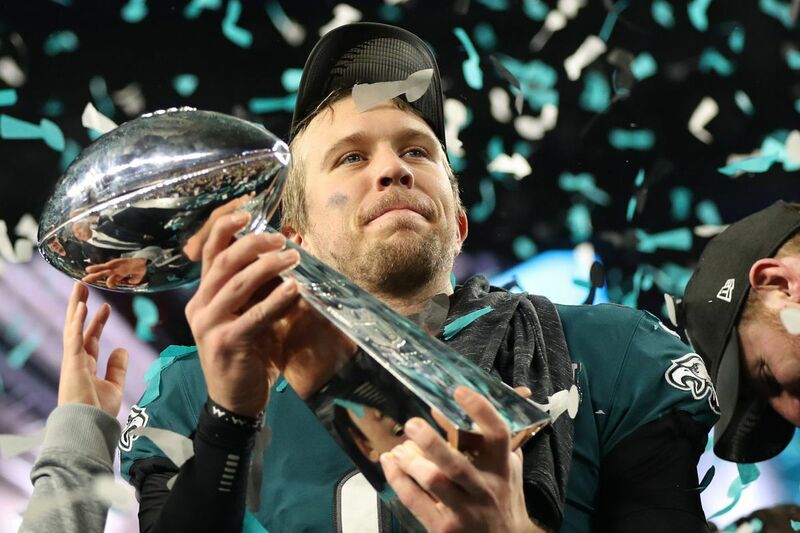 Nick Foles holds up the Lombardi Trophy after the Eagles defeated the Patriots to win Super Bowl LII. The trophy has been hoisted. The green confetti has fluttered. And the Macy's mannequins have been liberated from their window displays. It's been been a topsy-turvy time in Philadelphia since the Super Bowl LII clock ran down to zero Sunday night and the Eagles secured a 41-33 victory over the New England Patriots. Thousands of fans took to the streets in mostly orderly fashion, though the kidnapping of mannequins and more than one light pole were reported. And we haven't even had the parade yet. The Eagles and their adoring fans embraced the underdog nature of all this while denying the Tom Brady-led Patriots a sixth Super Bowl win. The Eagles had never won a Super Bowl, not since the game was first held in 1967. They had only reached the big game twice before in that time. For crying out loud, the Eagles hadn't won a NFL championship since Dwight D. Eisenhower was living in the White House. That was 1960, 58 long years ago. But we stopped crying out loud a while back. Underdogs? Sure. The players donned doggie masks, and we all followed along, barking mad at the disrespect, amid plenty of predictions of another parade for the Patriots. But there was something different about all this, a casual confidence in a city diagnosed for decades with an incurable inferiority complex. The Eagles and their fans weren't complaining about being underdogs. They were embracing it, owning it, laughing at it. In short, not so inferior after all. The fans in Boston call Brady the GOAT, short for "greatest of all time." So there was the GOAT, sitting on the turf in the fourth quarter, after being sacked by the Eagles defense and stripped of the football in a play that sealed the Eagles victory. And now the Eagles have that big, shiny, silver trophy. They join the Phillies, Flyers and 76ers — professional sports franchises that have all logged championship seasons. This is a city of winners, a place where the big thing blooms and thrives. Take notice, Amazon. Get on board. The pope came calling in 2015, packing the Ben Franklin Parkway with faithful. The Democratic National Convention filled the city in 2016. The NFL held its draft on the Parkway in 2017. And now, finally, at long, long last — a Super Bowl. And a parade, which will march north from Broad and Pattison on Thursday to the Philadelphia Museum of Art. For some, all this was too much. And bad behavior followed. There was some looting at a convenience store. A car was tipped over. A hotel's canopy collapsed under the weight of frenzied revelers. There were some arrests in the city. It got a little crazy, for sure. To this, we're reminded of an old bit of advice, often attributed to the late Green Bay Packers coach Vince Lombardi: "Act like you've been there before" when you score. The Super Bowl trophy bears Lombardi's name. So the guy knew what he was talking about. Come Thursday, Philly, cheer your team and parade with pride. But act like you've been there before.